Streetscape is the way your house and its architecture looks from a distance and fits into the rest of the street – is it in relation to the other properties and the rest of its surroundings? The streetscape of a property must aim to capture people’s interest. I think in turn this also has a positive effect on the value of the property. Front door or curb appeal (includes all major elements of the front elevation) is where things get more personal – one can see the style and architecture of the house and I think here you can also get a glimpse of the type of person who lives here. 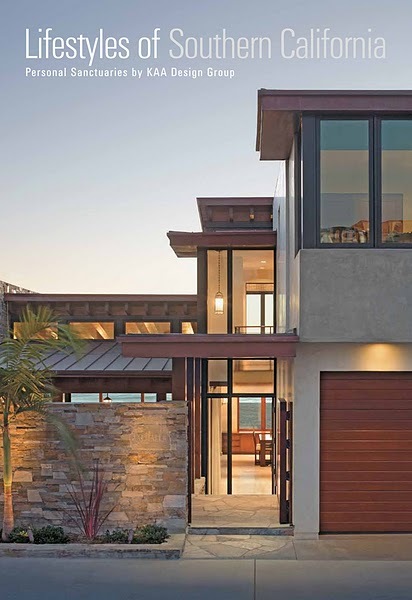 All the fixtures and design elements have an impact on this first impression… after all, it is the front door and entrance that sets the scene for what is to follow. The interior is the last chance to impress – interiors should aim to provoke the right kind of feeling as well as provide all the necessary functionality. It takes only a glance, maybe 3 seconds, to form an opinion of a house based on its architecture, the materials used and certain features. Using different building materials with different textures can create a visually interesting “look”; use of different levels and interesting roof tops are other ways to add interest and appeal; or even just using paint to highlight certain features will make a big difference to the property’s curb appeal. The use of different materials is what gives this home its curb appeal along with the clever layout of the path, blocking a direct view to the front door – this adds interest to the property, making one long to see more. 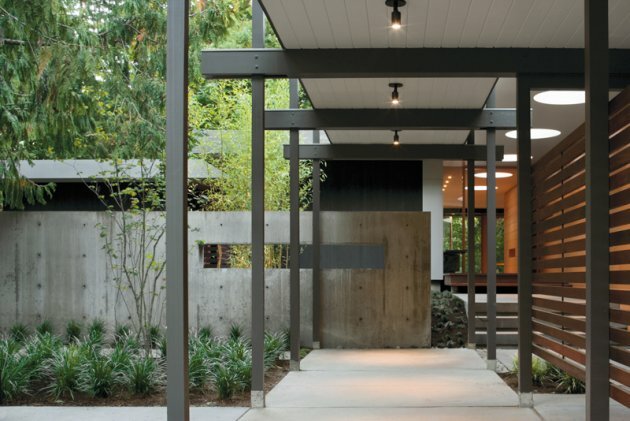 The combination of the concrete path, the concrete wall with steel bolts and the horizontal wooden slats all work together to form a visually pleasing picture. Architectural details like the differences in roof heights, the recessed feature with garden pot by the front door and the feature wall cladded in stone gives this home its curb appeal. 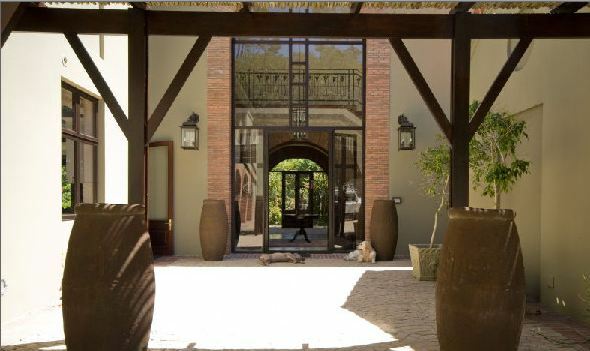 Rustic and beautiful – the covered walkway before entering the courtyard reminds me of entering a castle. Wood uprights and exposed brick adds to this effect. The double volume glass entrance adds to the interest and appeal of this home’s front entrance. 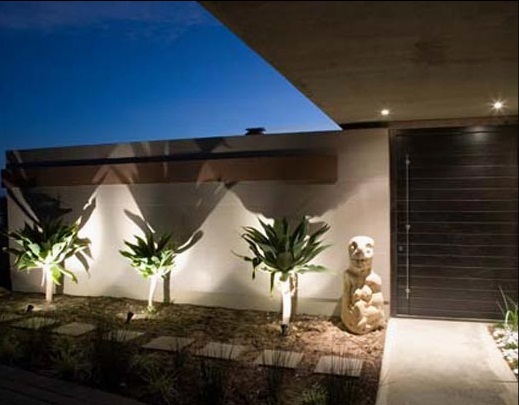 The simple use of feature lighting on the aloe’s and the square, straight lines of the boundary wall, the pathway and the concrete roof over the front door screams “Contemporary”. The garden is kept very simple, using only one or two different plants as opposed to many different ones – this makes more of a statement which makes this entrance quite striking. This house really appeals to me … the clever use of materials and the positioning of the buildings just caught my eye and makes me want to look some more. Different stone used for cladding, the raised pathway, I-beam insets, the big glass windows in the roof and mostly the corrugated roof that has no ceiling is what gives punch to this picture. 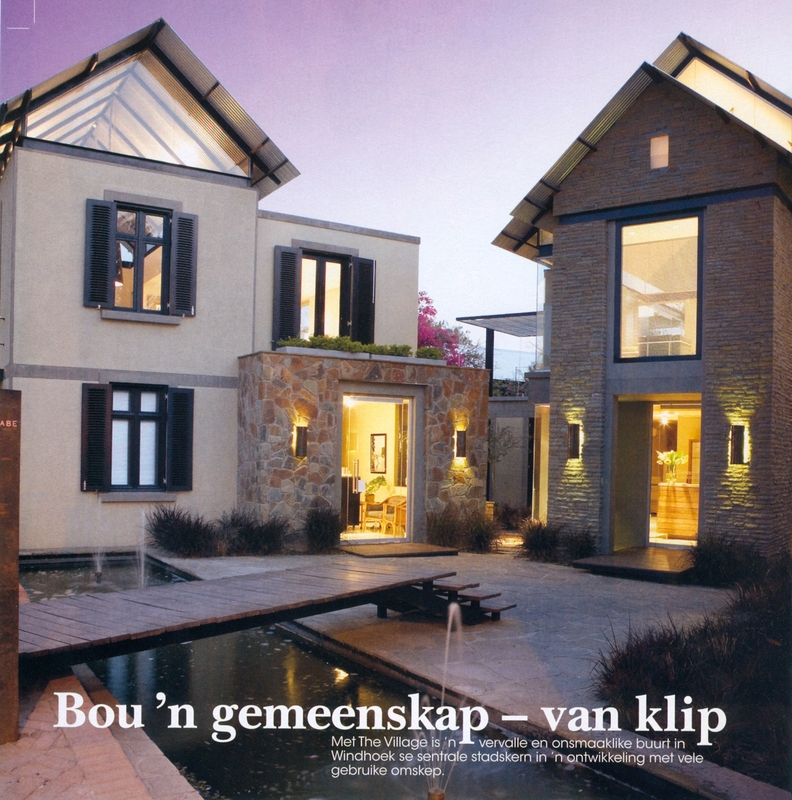 This is one of my favourites… I just love the architecture with the different levels/heights and the built flowerboxes allowing limited access to the glass front door of the house, giving a sense of privacy. I-beams and concrete… what can I say – I just really like the combination! 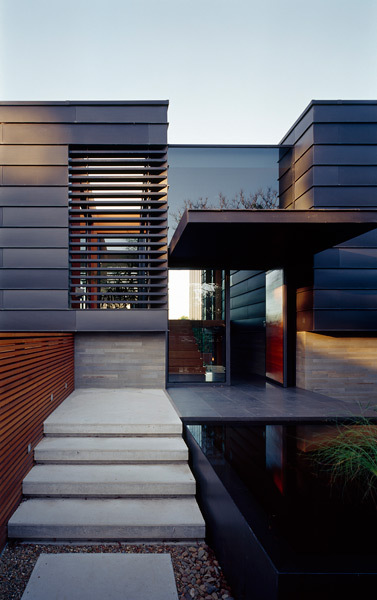 A contemporary home with striking curb appeal! Interest is added to this rather square shaped house by recessing the glass front door, and by using only glass even more attention is drawn to it. Also, by lining up the decking (over the water feature) and the floating roof cover it gives a sense that this area is floating in the air. Privacy from the off-centre pathway is maintained by the use of the horizontal slats that runs the full length of the glass window by the staircase. Visually interesting without being over-done. 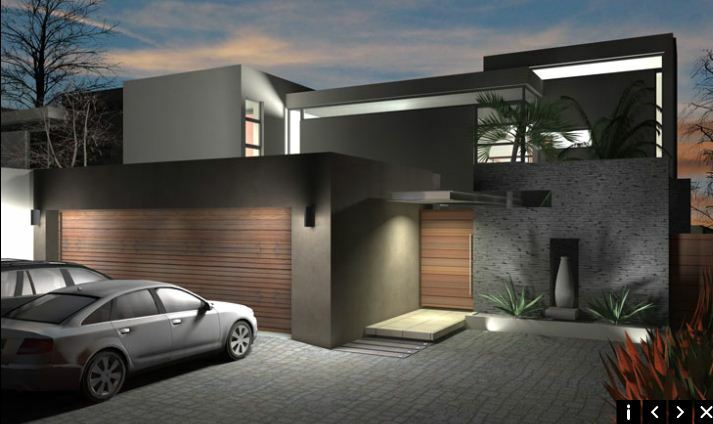 This house has great curb appeal – the cladded boundary wall, the combination of the charcoal window frames, the wooden detail on the roof overhangs and the double volume glass front entrance gives this house so much dimension and interest. 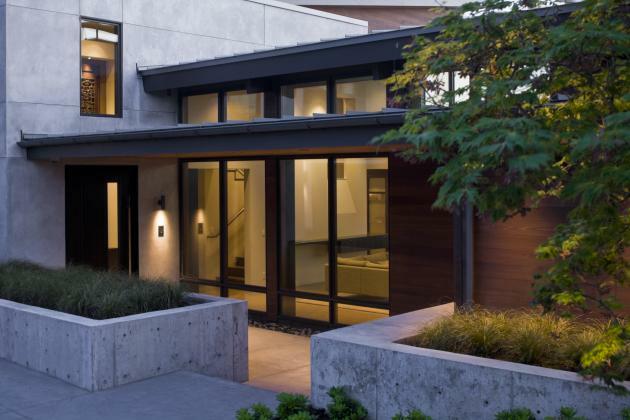 What would otherwise have been a simple entrance was cleverly enhanced by adding the cladded wall with discrete opening, adding detail to the roof overhang and by plastering 3 thin horizontal lines all along the exterior of this home. 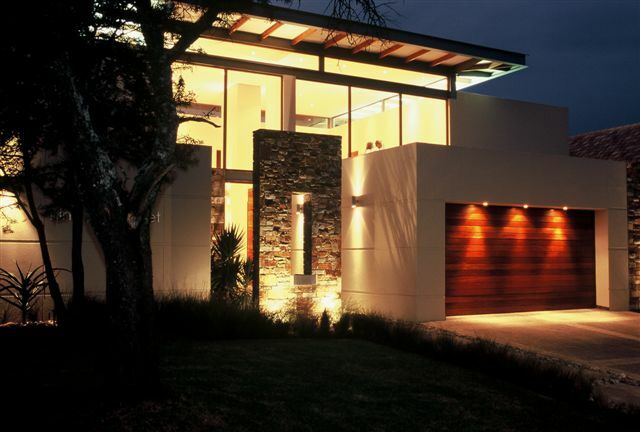 Use of feature lights creates a serene feeling at night time. 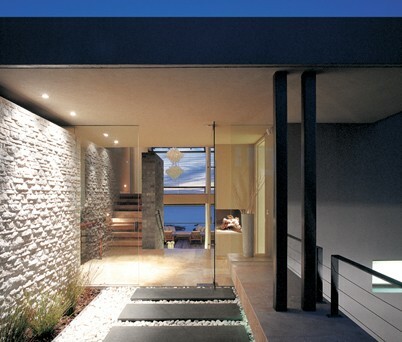 A simple yet elegant front entrance which would appeal to most people.